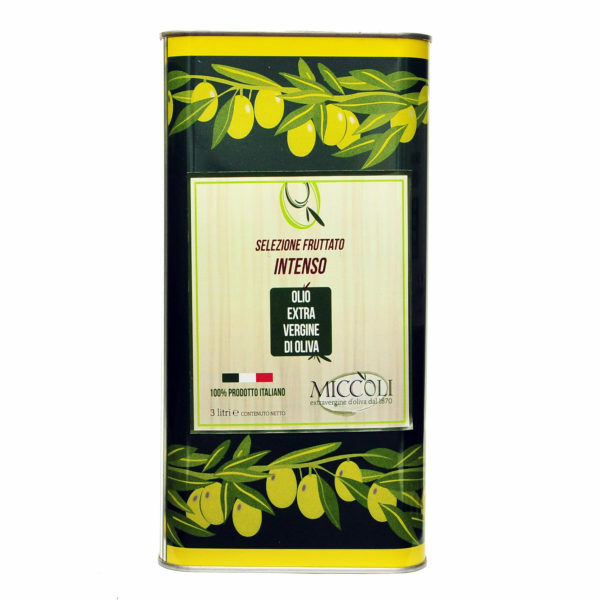 The extra virgin olive oil INTENSELY FRUITY is made from the best olives harvested by hand and immediately ground in the mill to provide low degree of acidity. The minimum quantity allowed for purchase is 2. The extra virgin olive oil, INTENSELY FRUITY is derived from a careful selection of olives grown in the terrains of Antonio Miccoli’s farm. APPEARANCE: Veiled by natural settling. AROMA : Fresh, herbaceous, with traces of artichoke adorned with floral scents that create a complex and elegant bouquet of smells. TASTE : Intensely fruity, with slight artichoke’s taste and pleasant bitter and spicy flavours. USE : It is an excellent seasoning for each dish. It is advised to be used with grilled meat, cooked vegetables and legumes, raw vegetables, cheese, bruschetta with tomatoes.